Rent the Blue All-Terrain Knee Scooter in Utah TODAY! It’s no wonder that the Blue All-Terrain Knee Scooters is one of our most popular models at The Knee Scooter Store here in Salt Lake City, Utah. With killer tires, a large basket, and adjustable settings, this is one of the least expensive outdoor-friendly scooters to rent. Adjustable handlebars on the Blue All-Terrain Knee Scooter make this model ideal for a lot of different sizes of riders. CLICK HERE to enlarge image. The Blue All-Terrain is rated to handle riders as heavy as 350-lbs. This makes this a wonderful choice for our Utah customers concerned about remaining stable. This is a very safe option. One of the key aspects of safety and stability you want to consider when choosing a knee scooter is a tie rod. This a thin metal piece connects both wheels together. You’ll see this with our less expensive models of knee scooter. Every bump and crack in the sidewalk pull the scooter too and frow. 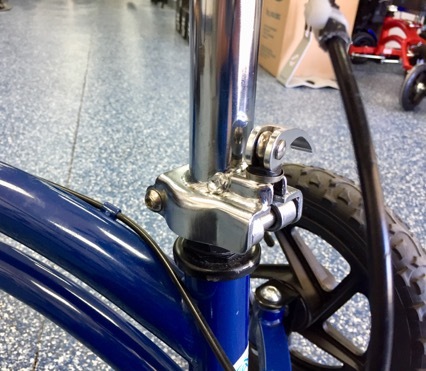 With the tie rod, the wheels stay stable while riding over bumpy terrain, whether on campus, on your way to work, or on a dirt road outside your home. See the larger tires on this blue all-terrain knee scooter. Safety is always a concern in Utah weather and rugged ground. CLICK HERE to enlarge image. The tread on a Blue All-Terrain knee scooter tire is gnarly. If you’re worried about snowy or rainy conditions, rest assured that the three wheels on this scooter will keep you safe. 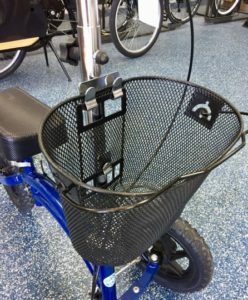 You’ll appreciate the large removable basket on the Blue All-Terrain. SEE LARGER image here. One of the biggest challenges you’ll find when you lose mobility with your legs is: How do I carry my stuff? You’ll love the large basket on the Blue All-Terrain. You’ll be able to put paperwork, a small bag, purse, or a tablet. Cruise around the office or your home with the assurance that your belongs will be secure. The basket removes easily when you’re folding-down the Blue All-Terrain for more compact storage. The seat is easy to adjust when finding the right position for your particular knee height. The Blue All-Terrain is designed to help users from 5′ 6″ to 6′ 6.” Easily adjust the seat with a quick-release-lever. 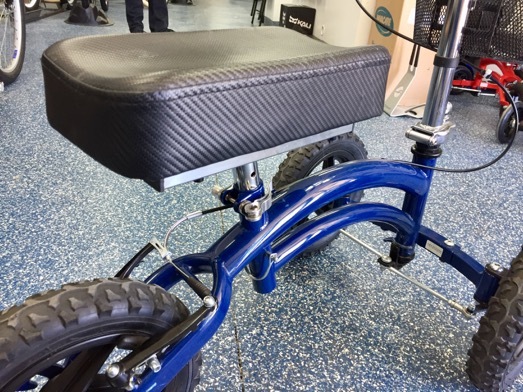 The seat of the Blue All-Terrain is adjustable and comfortable. Most knee scooters are foldable, including the Blue All-Terrain. There is one quick-release-adjustment that allows you to lower the front handlebars for more compact storage and transportation. Although this is one of the larger knee scooters on the market, you’ll be happy to see how easily you can fit this into most trunks to cars. If you need the most compact knee scooter for storage in a small car, consider this folding knee scooter for rent. 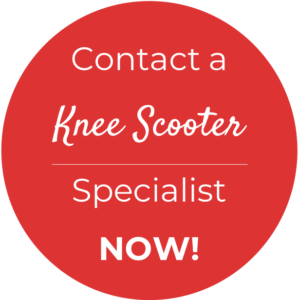 For quick questions about renting from The Knee Scooter Store in Utah, feel free to call us today. 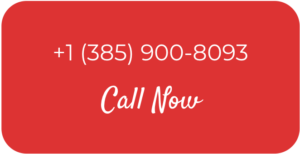 We’ll answer all your questions and find a great deal for you or your family member in need of extra mobility.